You can't open any architecture or gardening magazine without seeing ornamental or native grasses featured. Only a few short years ago there were a handful of kinds to pick from. Now there are tons more and all of them work well in a garden planter. A number of reasons why they are so popular is they are low maintenance, look fantastic and they adapt to most climates. 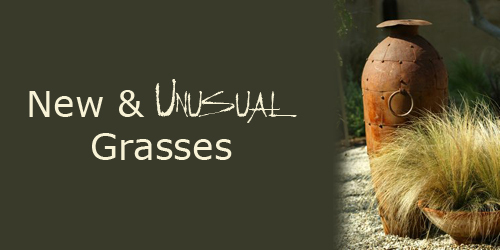 Here is a list of a few grasses that deserve wider use in America's gardens. While some are new, others have been around for quite a while and just been overlooked. Check them out! Autumn Moor Grass is a tidy work horse. It grows 12 to 16" tall and wide and loves full sun and light shade. Whether used singularly or in mass, this grass can be put to almost any use in the garden. 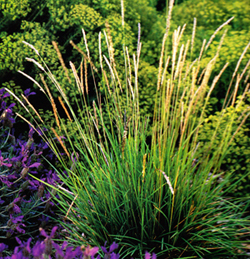 You cannot ask for a tidier ornamental grass than this, and it's considered one of the finest. It features beautiful bright yellow green foliage, which sports attractive, neat flowers, emerging white in early autumn and fading to tan. This is the go-to be-all grass to pot. Ruby Grass offers fluffy plumes. Grows 12 to 18 tall and wide and likes full sun. 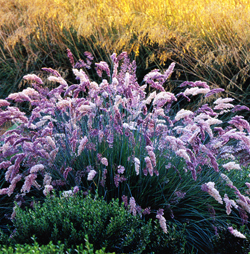 This clumping, blue green foliage grass has amethyst pink flowers that create fluffy, 8 to 12 inch long plumes throughout summer. Eventually, the flowers mature to the color of root beer foam. It's heat and drought tolerant, and it makes a fine annual in colder climates. 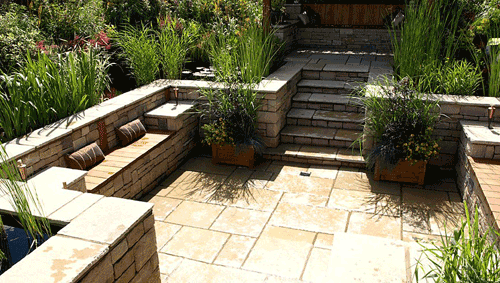 Excellent drainage in the garden planter you use will help it thrive in humid summer climates. Vetiver has unique leaf tips. This grass grows 6 feet tall and 3 feet wide so make sure you have plenty of room in the planter you use. It loves full sun to light shade. This beautiful ornamental has upright, glossy green foliage and interesting, animated leaf tips that resemble party favors. These plants gain reddish purple hues in the fall and winter. It is so good for the desert climates that it's used a lot to hide air conditioners in may yards. More gardeners find it useful in pots as a screen. It takes damp soils and is used to prevent bank erosion in canals and bayous. This baby is nice! Read more.....One pot, lots of plants! 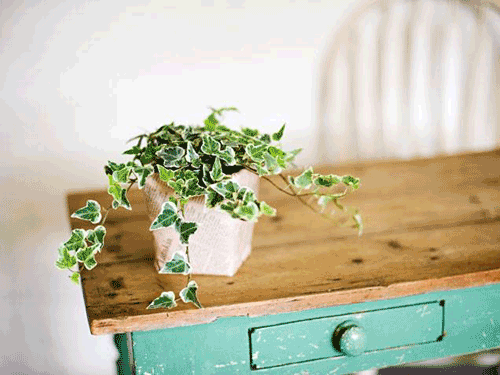 Here are a few great tips that we have read about on how to keep your houseplants healthy! Tell us what you think! 1. Purchase a water meter. It really helps especially in winter not to over water your potted indoor plants. It includes information about water requirements on special plants and helps to keep the water levels correct. There is nothing worse for indoor plants than to over water or under water. Get it right from the get-go! 2. Place the plants near a indoor tabletop fountain or below some under cabinet lights. Especially important for potted plants that flower constantly like African Violets. Ferns and orchids appreciate the extra humidity as well. This is a great idea for apartments with too few windows. 3. Top your potted plants with pine cones or faux rocks. It helps the soil to retain the moisture and keeps your house cats from digging in the soil. Both cats and potted houseplants stay healthy. 4. Take the time to give your potted houseplants a shower in the Spring and Fall. Wash the leaves on both sides. 5. If root ball becomes dense and water doesn't penetrate, use knitting needles to poke holes down into the soil so the water penetrates down into the roots and doesn't sit on top. Fill saucers with rocks and water and then sit the pot on top. That way they aren't standing in water but using the water as a humidifier. All good and easy tips. Read more.....Tips for fantastic containers. Read more.....Top dress your plant containers. Planting a mini cacti garden. Planting a bowl of cacti may take a bit of care and patience, but it is worth the effort since children love cacti. Once planted, the cacti ask nothing more than benevolent neglect and they look stunning! Start with a 10" terracotta clay low bowl of some shape and style. Since cacti has very small root systems you don't need anything deep. We love the natural clay look that clay pottery gives to the cacti but any dish glazed or not will work equally well. Fill the bowl with cactus compost to within 2" of the rim. 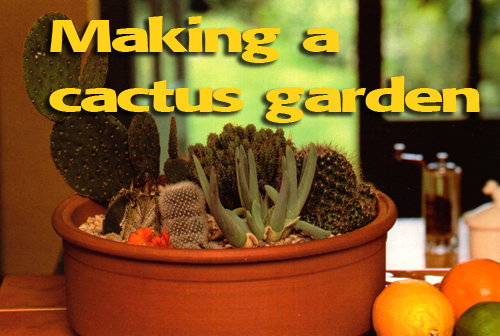 Prepare a thickly folded strip of newspaper to help handle the cacti. Before planting, decide on your arrangement of the plants by standing them in their pots inside the bowl. Ease the plants from their pots, surround them with a newspaper collar and lift into place. Handle more ferocious plants carefully, and leave the really prickly ones till last or you will stab yourself on them as you are planting the rest. Fill in around the plants with extra compost if needed. Add a finishing rock to the top and place the planter in good light. Water sparingly. If you have small children be sure to place the potted cacti in a safe area. 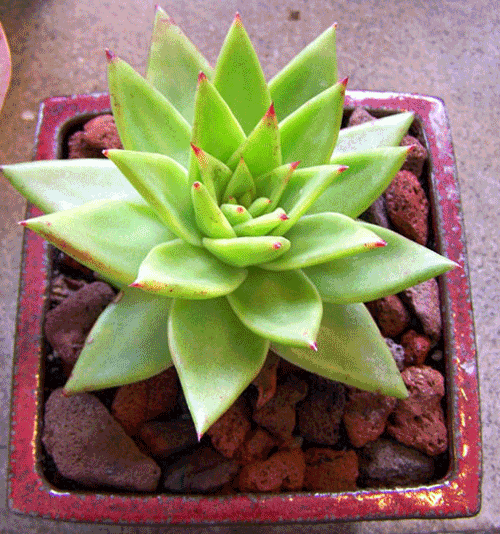 You can always substitute succulents instead; they require the same treatment and are thorn free. Read more.....Planting a cool pot. 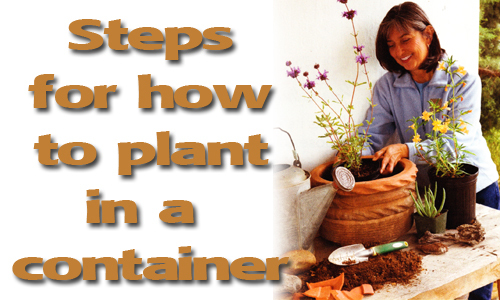 Steps for planting in a garden container. Methods for planting in a garden container are just about the same for every plant, whether you bring it home in a cell pack, flat, or nursery container of some kind. If you are starting from seed, then just follow the instructions on the seed packet. Of course the most important thing to consider is the container you start with. Make it large enough to accommodate plant growth but not so large that the plant is dwarfed by the pot. Try to find the kind of planter, poly resin, terracotta, etc that suits your needs along with the color, finish and style that you desire. We have many more blog entries on how to select a container so please refer to one of them for more details. 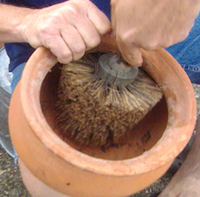 When planting in a pot that has been used before, begin by cleaning it out with a brush and hot water. Bleach will eliminate moss and disease and vinegar will dissolve accumulated salts. 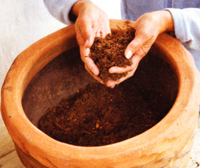 It's best to soak terracotta prior to planting so that the root ball doesn't absorb all the moisture. Cover the drain hole with mess screen, pottery shards, pot filler, or gravel so prevent clogging but allow drainage. You can plant in a pot with no hole but certain measure need to take place. Take the nursery container and water it thoroughly first before trying to remove the plant. Always try to leave as much soil around the root ball as possible. Run a table knife around the pots inside edge. Invert the pot and tap it gently to loosen the plant. Let the plant drop out, do not tug or pull. If your plant is in a gallon or larger nursery container it is best to cut the plastic pot away from the root ball. It is best to plant as soon as possible to prevent the root ball from drying out. Moisten the potting soil. 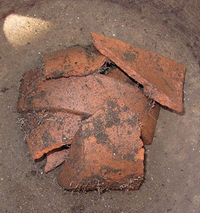 Pour some into the pottery making it thick enough to hold the top of the root ball about 1" below the pots rim. Fill in more moist soil around the plants sides, pressing it firmly to remove air pockets. Don't smash it down. After planting, water the soil thoroughly and tamp the soil to firm it. You don't want sitting water on the top of the plant. Keep your eyes on the potted plants for the first few days or so. Make sure that it doesn't sink and need to be refilled. Also check to see that the water is draining off properly and the roots are not sitting in standing water where they can rot. 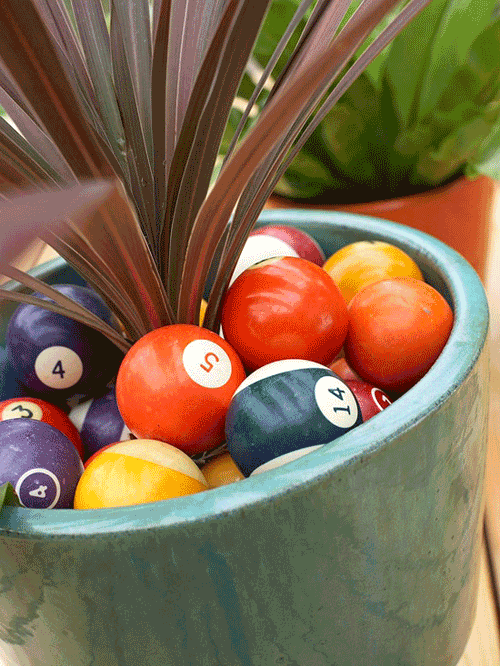 Follow these simple steps and have fun creating a potted garden. 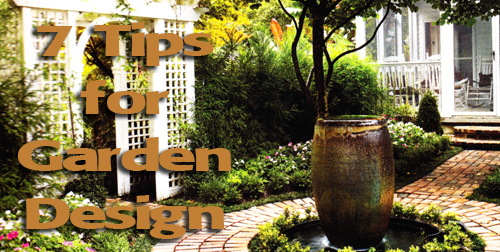 When it comes to designing a garden there are many things to consider. However, the top tips are creating something that makes you smile, is easy to maintain and easy to implement. If creating this oasis isn't fun and enjoyable then what is the point. You don't need a garden area right? but you want one. So, keep it simple and follow these easy tips. 1. All enough room. If you are limiting yourself to your patio area make sure there is room for entertaining. Don't fill up every corner! Keep an area for dining and sun bathing. Open spaces create a feel of more space even in small areas. 2. Plan for growth. 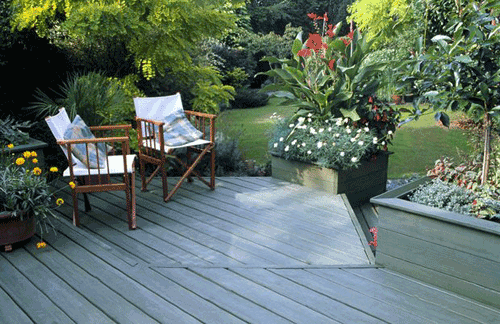 When selecting plants and containers make sure they won't take over the area your planning on spending time in. Having a dense look is nice but not necessary. 3. Keep all pathways open and uncluttered. Make sure that any plant materials or potted containers you set next to your walkways won't obstruct the path. This can be dangerous and uncomfortable for walking on. 4. Watch your over hang. If you use a gazebo or archway and cover it with plants make sure there is a height minimum of 7 feet. This give room for plant growth and head space. 5. If you love grass or have a pet, make sure there is at least a small patch of lawn. This is fun for games, animals and visual effect. 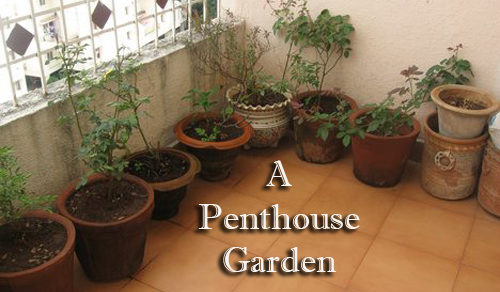 You can even pot grass if you have a balcony or deck area only. 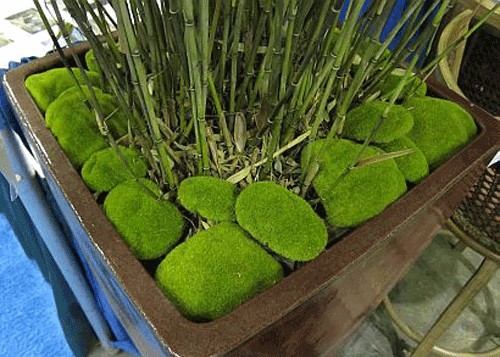 We love grass in a long rectangular planter. 6. Create comfort. Use art, birdbaths, statuary and other objects to create a decorative and personal touch to the garden area. Large planters standing empty are lovely. Statues tucked under large bushes or under a tree are nice added touches. 7. Use plant materials that you love that add color, or fragrance. Make them your favorites and ones you love to look at and enjoy. Make sure to use some evergreens so that there is color and ornamental's available year round. We thought this idea was adorable and wanted to share! 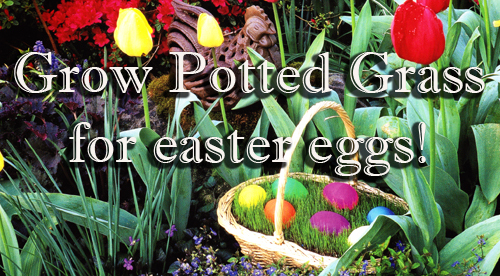 3 weeks before Easter, fill the container with thoroughly moistened potting mix. Top the soil, with seeds of a lawn grass blend of perennial rye and red fescue sold as a sun shade mixture. Then place the plastic eggs on the seedbed, so the grass grows up around them. They place the container on a plastic sheet in a room with good light and mist the seeds with a spray bottle several times a day. When the grass appears, the plastic eggs can be replaced by more elaborate ones made of glass or stone. If the grass grows too tall and conceals the eggs, cut it back with a pair of scissors. When the baskets are ready, they can be placed in the yard, garden or a patio area, tucking them between stones, bushes or even hanging on a tree branch. Beautiful & easy! 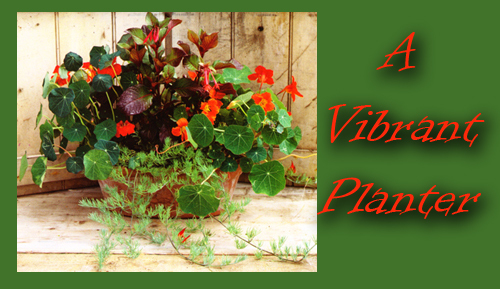 Read more......The A B C's of container gardening. A penthouse garden towering high above the skyline of a major metropolitan city is the equivalent of Eden for those of you who are garden lovers trapped in the big city. It's a tranquil oasis and retreat from the hustle and bustle down below, and the contrast vividly sharpens the appreciation. But, creating a area like this is a challenge. 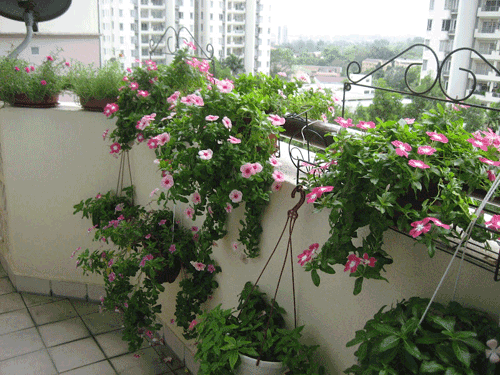 When it comes to roof-top potted patio gardens, you will have specific challenges. Space is a premium, building codes for weight and materials must be adhered to and the rooftop climate swings can create extremes. Obviously all the plants you want to use must be contained in some sort of planter. As with any garden even ones you a back yard there will be special problems and opportunities. 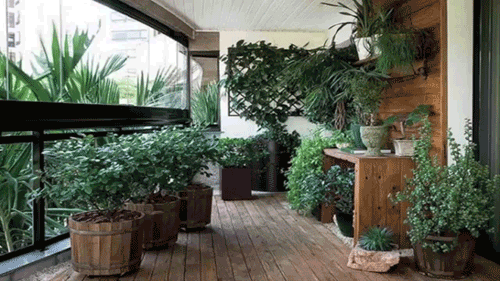 Limited Space: A postage size potted garden serves as a outdoor room for summer living and entertaining. You want to create the appearance of lushness without crowding out people so planters that take up a minimum of space is perfect. We like the tall, slender ones show that can hold a tall, narrow tree to create maximum impact in a vertical space. They need to be big to hold enough soil for the size of tree you want to plant to develop a healthy and hardy root system. When you crowd the containers together the foliage mass create a natural living barrier for privacy and to block unsightly other buildings. Make sure if you are working in a load limitation that the trees, pots and soil are all in that range. Weather is exaggerated on a rooftop. It gets colder and hotter than on the ground levels below. It's good to have at least half a day's shade to moderate the summer heat. Moisture supply can be another problem on a rooftop. Rain that soaks into ground level soil is always available but on a rooftop most of the rainfall runs off. The amount that soaks into a garden planter is much less than would be available to plants growing in the ground. In addition, the drying effect of extreme temps and winds is a real threat to the potted plants. They bake in summer and freeze in winter. The solution is a watering systems. 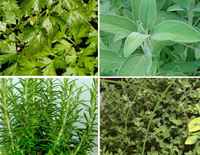 It reduces the stress on plants and relieves the home owner of this chore. In the winter you can turn it off so the water doesn't freeze in the pots and crack them. 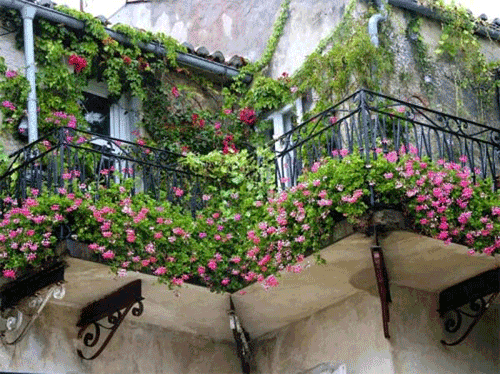 There are certain types of plant materials to consider when selecting them for your planters. Conifers are ideal because they provide a variety of foliage colors and textures, are interesting to look at and tolerate extreme heat, cold and winds. In late spring you can plant a few colorful annuals like impatients and salvias. They tolerate being crowed into planters without succumbing to fungal problems. 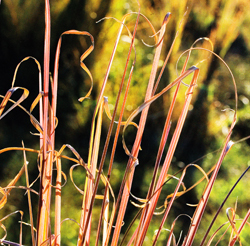 Perennials don't tend to fare well, as they are too vulnerable to cold temps. Obviously ground level rules don't apply of a rooftop. Most important is selecting plants that are slow growing, tolerate crowding, and hard most of the year. But, of course don't forget.....they have to fit into the elevator first! 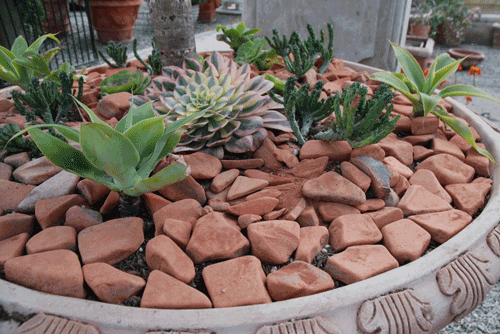 Read more.....Planting a potted Rock Garden. 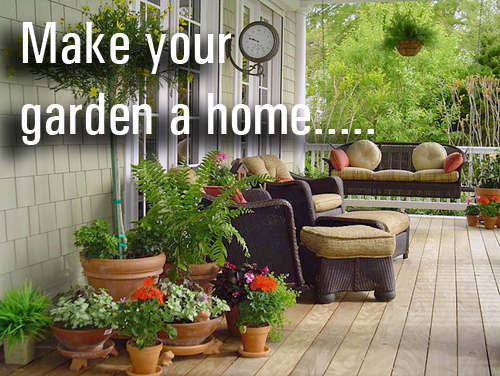 Read more.....Making a garden a home. The earth tones of this small decorative terracotta window box are topped with the fiery reds and oranges of the plants flowers. The fuchsia with its orange foliage and tubular scarlet flowers, the orange nasturtiums and the red clay like flowers of the feathery leaved lotus. We have many clay rectangular planters in our terracotta pot section so check them out and find one that you really like. Then create this look for yourself! Step 1 - Is to cover the base of the planter with drainage material. You can use gravel as shown or pot shards, packing peanuts or pot filler, which we sell in our pot accessory section. You don't want to block the drainage hole with compacted dirt or the plants root systems will rot. Step 2 - Fill with potting mix and add a teaspoon of fertilizer. Plant the fuchsia in the center of the window box container. Then plant the nasturtiums along the back of the planter so you can stick the lotus in the front. Step 3 - Place the two lotuses in the front on either side of the fuchsia. Water the soil thoroughly, leave it to drain and stand it a sunny place. This stunning fuchsia is worth keeping for next year. Pot it up in the autumn, cut back by half and overwinter on a window sill or in a heated greenhouse. Plant in Late spring or early summer for most success. Read more.....Garden of reading for kids. Read more.....Starting plants from seeds. Cacti, succulents, aloes and sotols are amazing when it comes to tolerance of human forgetfulness or hot baking sites. They tend to thrive where other potted plants fail. Using many of these in your garden ahead will provide year round beauty with little attention. 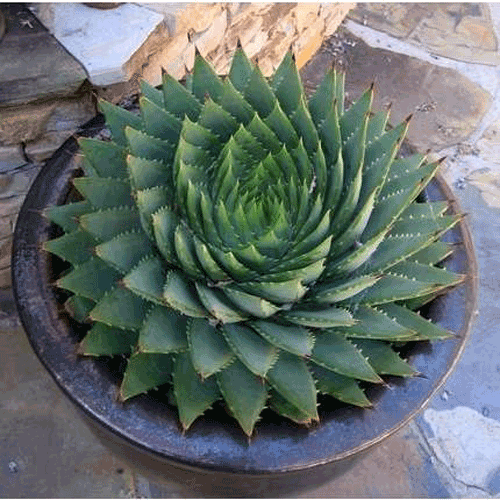 Drought adapted plants also have strikingly different forms, color and textures which add uniqueness to your garden or patio area. What's really neat is that they conserve water resources and time when it comes to watering them during the summer months. You can use glazed as well as terracotta when it comes to the best types of containers. The main thing to consider when using these types of plant materials is trying to match the pot size to the plants root mass. By minimizing the container it keeps the soil mass smaller which helps it to dry out quickly once watered. These types of plants like a compact area where water is scarce, so don't worry about confining the roots. You will know by looking at the size and health of your plant if it is time to re-pot in a larger container. Even though these potted plants like it dry, they need to be watered and fertilized periodically. You must however give them a dry spell between watering's. That time can last for days or even weeks, with no harm done to the plants. When you do water them be thorough. Most pots like a liquid fertilizer at half strength about once a month during the growing season. You can mix in slow release fertilizer in an established container. 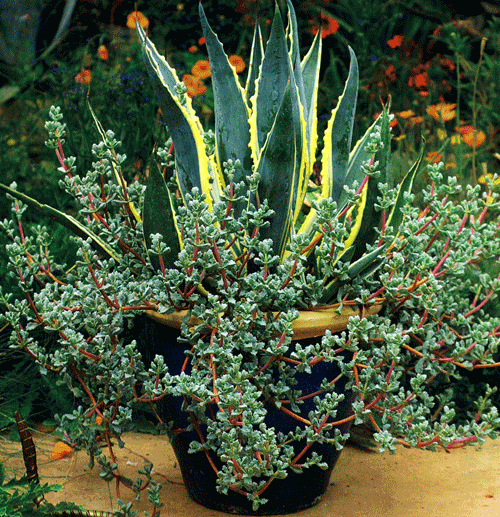 One of the most easy to find groups of drought adapted plants is succulents. They store water in their leaves unlike cacti that has no leaves and hold their water in their stems. 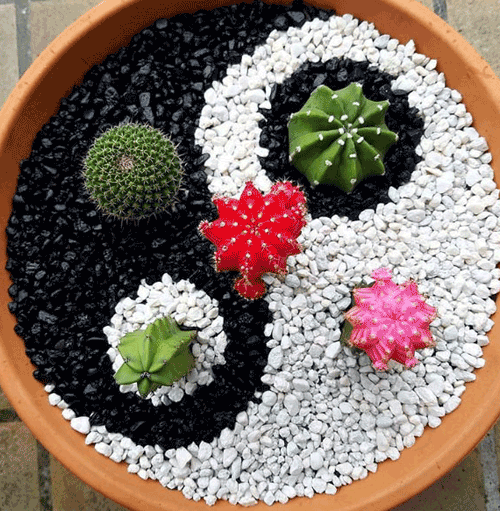 All cacti grow well in plant containers so don't hesitate to experiment and give them a try. We think you will really love this way of container gardening. 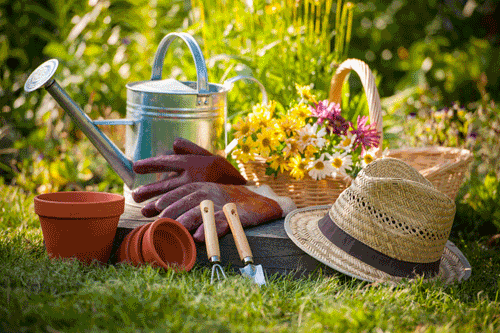 Read more.....Grow your own backyard drugstore. Making A Patio Garden A Home! The garden/patio is becoming a place to live rather than being simply an accent to the house. As it becomes more and more expensive to travel and gas prices run through the roof, more people are spending their money to stay at home. 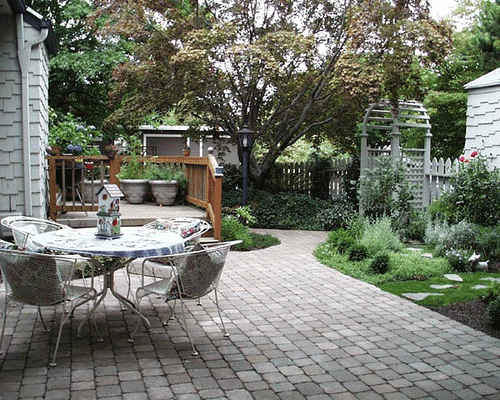 They are making their patio/garden areas wonderful places to be and to enjoy! Patio areas are becoming more elaborate and pleasing along with functional. People are investing in nice furniture to sit on and relax. They are filling lovely garden containers with sweet smelling plant materials that they can enjoy. Add statuary, ornamentation and structures like gazebos are all being done. New and bold plant colors are finding their way in and pushing the pastel colors out. Plants such as zinnias in strong colors like red and yellow hold up the the harsh temperatures of Summer and look bold instead of washed out. Bring colors are being used in patio furniture and furnishings. Don't just limit those shades to plant materials, paint your furniture if you need to. There are many products available for outdoor furniture at your local Home Depot. When it comes to containers there is a wide selection to choose from. 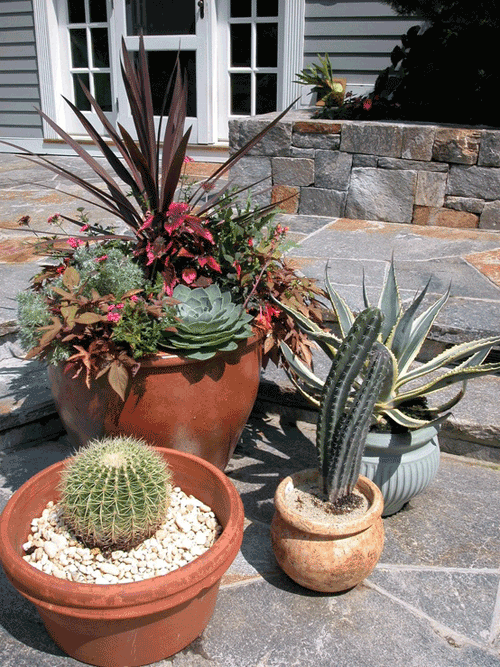 The popularity of planting gardens in containers increases every year. This way you can control the root spreading by containing them and you can control the water that is applied with a drip system. Products like water retaining soil additives and more aware water wise plants are being widely used. New plants are showing up everywhere. The basic red geranium is fading in popularity and growers are provided more sophisticated plant selections. As more gardeners catch on and demand for even greater choices increases, the container gardening palette will only grow richer. Read more.....Cure insomnia with cleaner air! 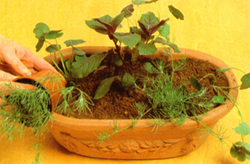 Now is the time to plant your herbs in the garden pots just sitting on your patio with nothing in them. They are lovely, fragrant and hardy so you should have great success in growing them. We have shared many tips on how to plant them in other posts on this blog so on this one we are going to concentrate on how to preserve them. Usually when the growing season draws to a close, you want to take advantage of the potted harvest you have. 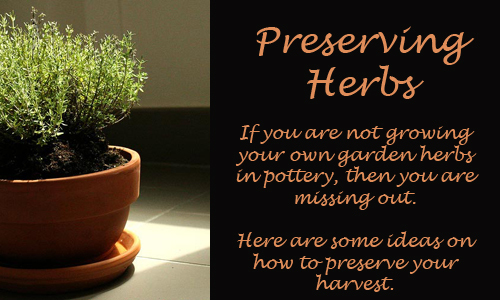 Preserving herbs is easy and you have a couple of ways to do it. Once they are preserved you can give them as gifts, share them with your family and friends or use them yourself in recipes. They are healthy and good to eat and enjoy so don't wait to start growing and enjoying them. Hang the bundles, leaves down in a warm dry place away from direct sunlight. Make sure that air can move freely around the bundles and they aren't touching anything. It usually take 10 days for leaves to become crisp enough to crumble. Remove them and store them in an airtight container. Microwave drying: Line a dinner plate with paper towels. Arrange 1 cup of leaves in a single layer on the towels. Try not to overlap. Cover with another towel and heat for about 1 minute. If not completely dry keep drying at 30 second times until crisp enough to crumble. Let the leaves cool before putting them in a airtight container. Watch this process closely since they tend to burn if you leave them in to long. Freezing: We love this way of preserving herbs. Lay leaves in a single layer on a baking sheet. Freeze uncovered till rigid about 1 hr and then place them in freezer bags and return at one to the freezer. When you want to use them just take out what you need and chop while frozen. Some leaves like potted rosemary will darken slightly when thawed but the flavor is still robust and delightful. Use these frozen leaves to make basil pesto or mint for ice tea. Herb butter are great and tasty. Potting your own herbs is easy and fun. We hope we have given you some great ideas on what to do with your harvest. Enjoy! Doesn't the idea of planting a favorite plant in a pot seem simple and easy to you? Just toss some dirt in a pot, stick in the plant and wa-la and instant garden? Next thing you know your plant is wilted and the pot is cracked. Well, we have a few suggestions that will ensure that you have great success. Potting: When it comes to selecting the planter you need to take into consideration a few simple tips. How big is the plant your going to use? Make sure the pot is generous enough in size so that you don't have to re-pot it the first year of growth. 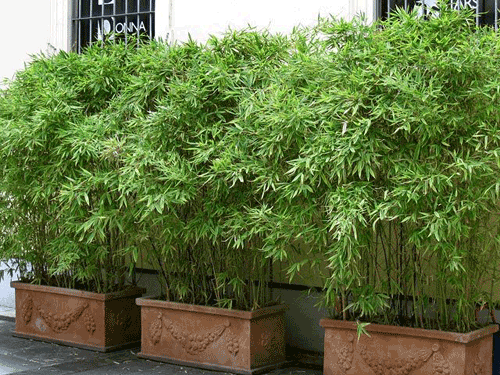 Then decide if you want terracotta pottery for a super healthy root system or concrete or ceramic for a more durable and long lasting planter. Get creative and go with bright bold colors or do you prefer a more muted earth tone? Most plants need a drain hole so that the plants roots aren't sitting in water but many times you can just drop a nursery pot into a decorative planter and have it drain right in the decorative pot and not flow on the ground. These are all good things to consider when planning on a container garden. Plants: Consider what size they will grow to when mature. That way you are not re-potting every year. Place them in the arrangement you want before planting in the pot so you can see how the display will look. Pop them out of their nursery trays carefully and plant them in the soil leaving 2 inches or so from the top of the pot and the top of the soil. Lighten up the weight of a large garden pot by using our Pot Filler. Prior to planting you can dip the root ball into a mixture of water and root stimulator to ease the shock of re-potting. Fertilizer: Because you want to frequently water the planted container it tends to wash away the important nutrients out of the soil. To replace them use a combo of time release pellets and liquid fertilizers. This will help to keep the potted plants healthy and war off pests and disease. Reapply as directed. Some plants have special needs to be sure and ask the nursery where you buy them. Then watch for weak growth, discolored leaves and underdeveloped flower buds on these potted plants and flowers. It could indicate disease or insect problems. Watering: Obviously roots can't find ground moisture because the plants are in a decorative planter so be sure and keep them well watered for better health and plant growth. Plants suffer from too much water as much as too little. Most containers usually require watering once a day during summer but pots in direct sunlight or exposed to super high temps may need twice a day. If you top dress your pots it really helps to retain the moisture. Use river rocks, faux rocks or mulch. Drip irrigation works great with potted plants so use it if you have it. Hopefully you found something new to try. We wish you much success with your container gardening. Read more.....Grow your own drugstore. By dressing up the top of your garden planters with decorative materials it will not only make the pots look outstanding but the items will help to retain the soil's moisture. Looks & Function create a great combination! By placing a topping of some kind of material on top of the soil of your potted garden plants it helps to prevent the soil from washing out of the pot when you water. It also traps the moisture that would quickly evaporate from uncovered soil. Your plants roots will stay cooler, even in the hottest weather and are able to spread more uniformly through the soil in the pot. These are all great things for the health and growth of the plants that you love so much. Another way to look at top dressing your garden pottery is: have you ever potted a plant and wished for something to add a bit more spice to your creation? Everything looks OK but just not exciting! by topping the soil with decorative materials you add a touch of whimsy and eye catching finish to a lovely planter. It's fun and creative and you can really get your decorative juices flowing. The main thing to consider is you want to build a barrier between the top of the pot and the soil that surrounds your plants. You can use many different kinds of materials and really the only thing that is limiting you is your imagination. Try colorful marbles that will glimmer and shine in the sun. A seashell collection from your last trip to the beach or a rock collection of rocks from your many hikes are all good toppers. Polished rocks, and faux rocks give a zen feel to the planted pot. We show pot shards on top or fresh picked fruit. If you have children involved, try using their plastic toys or fun games pieces like checkers, or chess men. Use your imagination and have fun. It's healthy for your plants & you!